There’s an article in today’s Wall St. Journal about the increase in outsourcing of work in the auto industry; increasing amounts of parts are being made in Mexico and other low wage countries and then installed in “American built” cars in the US. Simultaneously, the wages for auto workers here in the US have dropped drastically – down to as low as $10/hour for new hires. 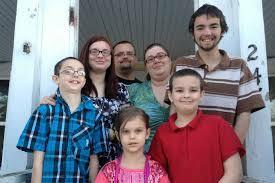 John Childers and Chrystal Varty (pictured here with their children from previous marriages) work for American Axel & Manufacturing and make $10/hr each. “Lower class is what we are. Let’s be honest,” says Childers. Instead of linking up with the Mexican auto workers to raise the wages of all, by joint strikes if necessary, the UAW leadership has bought into the idea of competing with them to see who can make greater profits for the employers. This “race to the bottom” destroys the entire purpose of having a union. As long as unions are embedded in capitalism they will have a left and a right wing. If they are democratic both wings will find a way to express themselves. I think this is important because leftists need to recognize that as long as competition for jobs is a fact of life, business unionism will find an echo in the rank and file. People are required to compete at the same time as they need to cooperate to earn their daily bread. People will run with solidarity up to a point, then the tide will turn and people will move back toward competing with other workers. This ebb and flow will continue as long as we have capitalism. Right? So unless a union is a revolutionary union, which I don’t think they can be, their entire purpose will never be to eliminate competition. Although it may be the entire purpose of whatever revolutionaries are in unions. I guess my point is that people will generally not take solidarity to the point that they destroy the company they work for. But they might do it if they thought every one else was going to do it, and that would be a revolution. Workers organized unions to stop the undercutting of one worker against another. It spread from individual work places to cities to the entire country and within entire industries. The old UAW was a prime example. In its heyday it controlled the entire auto industry, thus preventing workers from Ford, let us say, from competing with and undercutting the workers from GM, thereby boosting the standards of all. When outsourcing really got underway, along with runaway shops – first to Mexico and then elsewhere – this competition reared its ugly head again in a new and more generalized form. In the building trades, which is my background, it was simply the growth of non-union (“open shop”) construction. What was the response of the union leadership? We’ve seen the same thing in the auto industry, where the NON-union pay scale has gone down and down as the union scale for new-hires drops. The thing is that the union leadership has closed the door and locked it with unbreakable locks to the idea of returning to the methods of the ’30s. So it makes them incapable of really organizing, meaning incapable of reversing this cycle. At the same time, since they cannot conceive of a real break with US capitalist politics, they feel duty bound to represent the interests of US capitalism overseas, so serious international solidarity is also ruled out. As a result, even if they didn’t think they were responsible for helping assure that the employer makes a profit (or, in the case of public workers, that the budget is complied with), they wouldn’t be able to stop the never-ending downward spiral. A union doesn’t have to be a “revolutionary union” to break with the team concept and break with sticking strictly with legality. In fact, the whole concept of a revolutionary union is an impossibility. The union has to include all the workers in any work place – or strive to do so – but by definition the great majority of workers will not be revolutionaries except in the most exceptional of situations, meaning a revolutionary situation. In an earlier period, workers went from local struggles to national ones as capital went national. Now, the unions have to go a further step and go international, not just in words but in deeds. This means organizing global strikes if necessary.